Setting a new precedent here – blogging about a book even before I’ve finished reading the first chapter. 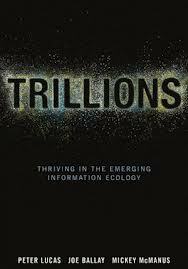 But I’m reading Trillions at the recommendation of several close friends in the industry (Phil Windley, Peter Vander Auwera) who believe it’s highly relevant to where we are going with personal clouds and XDI. And just the introduction makes so much sense that I know I’m going to savor every chapter. If you want to see why, just watch this brilliant 3-minute video from MAYA, the company behind the book.